McMurphy (Jack Nicholson) is a criminal who has been moved to a mental institution. It seems that, perhaps he is not mentally ill, but has faked it to avoid the hard labour of prison time. 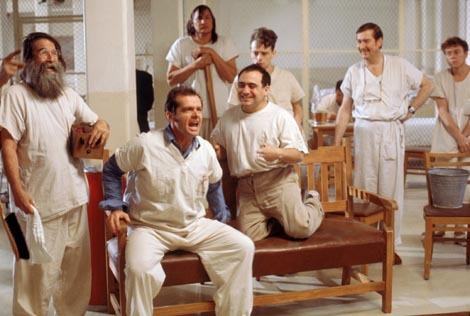 There, he becomes a part of a group of patients who are seen over by the dominating Nurse Ratched (Louise Fletcher) and tries to raise their self-esteem and make their lives better in his own, ultimately flawed manner. What a classic. You want to believe that the evil Nurse Ratched has her patients’ best interests at heart, yet she seems to be constantly getting the upper hand in power plays against them; most notably Billy. Then, when McMurphy comes along, she is challenged and cannot let things go until she wins. Also, McMurphy is a nasty piece of work; he just wants his own way and to have fun with little consideration of the consequences. But, being a selfish so-and-so obviously doesn’t deserve the treatment he ultimately receives. One Flew Over the Cuckoo’s Nest won Oscars for Best Picture, Best Actor in a Leading Role (Jack Nicholson), Best Actress in a Leading Role (Louise Fletcher), Best Director (Milos Forman) and Best Writing, Screenplay Adapted From Other Material (Lawrence Hauben and Bo Goldman) and was nominated for Best Actor in a Supporting Role (Brad Dourif), Best Cinematography, Best Film Editing and Best Music, Original Dramatic Score.